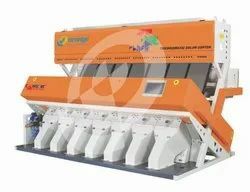 Our product range includes a wide range of Dal Sorting Machine such as Guargum Split Sorting Machine (Camsort), Guargum Split Sorting Machine (Pappu), Bauger Sorting Machine (Pappu), Bajra Sorting Machine, Avarai Dal Sorting Machine, Bauger Sorting Machine (X Sort) and many more items. Now, sorting different commodities wider than 4mm pitch, with defects of specific size is made easy. 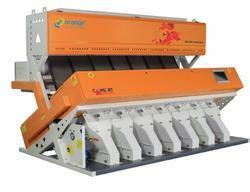 Thanks to the ORANGE’s X sort WP – Wide Pitch Multi Grain sorting machine with contour mapping and Quad Level Sorting Technology. 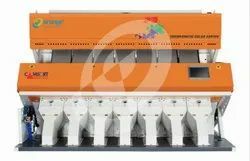 Presenting the all new X sort WP – Multi Grain color sorter from the house of ORANGE- India’s No1 brand in sorting machines that gives you accurate results, great performance and good service backup. X sort WP is the result of enthusiasm & continuous R & D to provide a top of its class color sorter for food industry in India and abroad. Now you can demand for more output with less number of channels in our X sort WP series color sorters. This series machines are the combination of best technology available today and our decade of experience in the color sorting industry to give you the ultimate benefit of getting consistent good purity in sorting with very minimum loss of good grain in the rejection. With its powerful 2048 pixel dual side camera, 1 mille second ejector response time and quad level sorting technology, you can get your sorting done at great accuracy and speed. What’s more, this machine is built with embedded computer and can withstand any future inventions that will be made in sorting algorithm. This machine is designed unique with the powerful software that makes billions of right decisions to identify shape and size of defect, spot defect and watershed algorithm to arrive the area of every product pass through our high tech CCD camera in a mille second. This machine is custom made for dhal sorting and is value for money. It gives excellent output in less number of channels. PAPPU is superior in its class with the double side camera that ensures optimum quality in sorting specific dhal varieties. PAPPU is available in 3 different specifications like 150, 180 & 240 channels with output capacity of up to 3 tons per hour* if 2% contamination is present in the input commodity. The commodities that can be sorted using PAPPU are Tuar dhal, moong dhal, Channa dhal etc. This machine is custom made for dhal sorting and is value for money. It gives excellent output in less number of channels. Magicplus is superior in its class with the double side camera that ensures optimum quality in sorting specific dhal varieties. Machine is available in 4 different specifications like 60,90,120 & 150, 180 & channels with output capacity of up to 3 tons per hour* if 2% contamination is present in the input commodity. The commodities that can be sorted using PAPPU are Tuar dhal, moong dhal, Channa dhal etc. 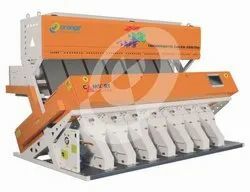 We are one of the leading manufacturer of Pulses Sorting Machine. Contact with us to get the best featured Pulses Sorting Machine machine at best industry prices. 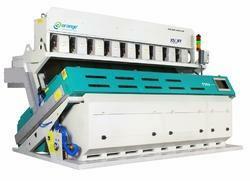 We manufcaturer and supply Tuar Dal Sorting Machine , conatct us to get the best deal. Software The Intelligent Edge Detection and outline Mapping technology find shape, Spot Detect and Size of Defect. Simultaneous Sorting Mode to remove Dark defect and Light defect at the same time. This feature can be set for individual cameras too. FPGA Field Programmable gate array with 5 million gates designed and manufactured in Germany exclusively for ORANGE. QUAD Level Sorting Technology to set different levels to sort precise spot defect, and chalky. Arroza equipped with Defect Grouping dark and Light sorting technology. It can group he defects at two levels as color defect and spot defect and each group it can sort dark and light defect thus giving you the benefits of 4 levels of sorting for your input commodity. LED light design to improve illumination also for better life time. User Friendly Human Machine interface to display and operate the key parameters using touch screen. Programmable defect size to instruct the machine to measure the length and width of the defect's size in your input commodity and accept or reject it according to your need. Diagnostic Facility to measure voltage, current, air pressure & status at different stages to identify the condition of the machine inside.